I think the Universe is telling me there is something else I need to pay attention to. I’ve been sitting here since the early hour of Yogi’s first visit to the yard for his morning pee, knitting in hand, now on round three of ripping out stitches back to a place I was last night, unable to advance even one small row from where I was when I went to bed. It is so blatant, finally, this Rafiki-esqe hitting over the head with a stick to wake up and just stop, pay attention. But to what? I’ve been wanting to write about fear but have been avoiding it. Maybe that’s it. Afraid of admitting how miserable I’ve been with a cold that has clearly turned into a sinus infection and the morning purge of nose blowing and coughing that leaves me exhausted before I’ve barely woken up. The knitting has been a balm for me during the course of this cold. I’ve managed to get some work done, attend to the dogs, do the bare minimum, and then park myself back on the couch with the Hap lace shawl I am teaching myself how to make, and just knit. Originally it was to be the full square version, and I was pretty far along, well into the multiple rounds of border lace, consciously ignoring the fact that my stitch count was consistently off and that I didn’t really like the colors I chose. I just kept going. Then, just about the time this cold began, I stopped, ripped it all out back to the original triangle, changed the color scheme, and decided to continue with the half version instead. It has been a joy these past few weeks paying attention, making sure the stitch count works each row, watching this piece develop and become something beautiful. 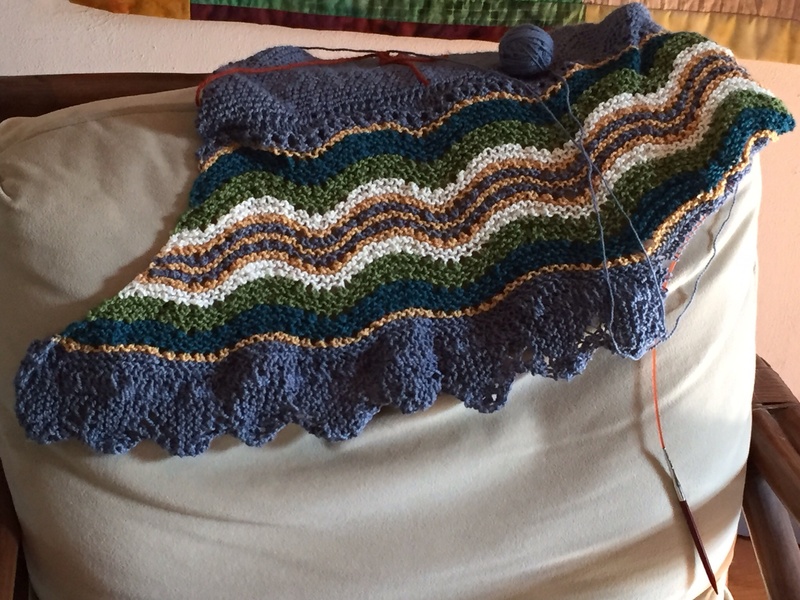 A few days ago I was finishing up the last border round before beginning the scallop edging. I had already read the pattern and instructions many times and felt the fear of taking on this part which was new and complicated, afraid of messing up what I was so happy with to this point. It was the morning of a big walk with Nora. We were out early. When we arrived at the pond, the stillness was pierced with the most amazing sound, a cross between a frog and a chuckle and the sight of little bobbing heads gliding through the water. I sat quietly contemplating the space between us, watched as the mother of this band of otters would swivel around and look at me, curious too, moving in a little closer for a moment, then leading her little family far to the other side again. Nora and I went on to explore a new, barely discernible trail taking us deep into a place I hadn’t been before. An hour later, thinking I was backtracking along the same path to our starting point, I realized I was very lost. Mysteriously, the Gaia GPS tracker app on my iPhone had stopped working. It became a clear and joyous moment of reckoning with my confidence and power. I was’t even a little bit afraid. I simply started walking and knew the path back to where I needed to be would reveal itself. It took some time, but eventually I recognized the feel of where I was in these woods that have become so dear to me, and eventually landed on a path that was completely familiar. I was curious about the otter energy that had been with us during this adventure. Reading in my Animal Medicine book, cross referencing Animal Spirit Guides and Animal Speak, I learned that ‘otter’ is woman medicine. It embodies the beauty of a balanced female side that creates space for others, for new energy to enter without preconceptions or suspicions, without fear. It is anchored in the understanding that all accomplishments are worthwhile for the whole tribe. It is playful mother energy, unencumbered in the making of family a priority. It is about sharing power without guile or jealousy. I felt the emotion rising in me as I read it all, the gentle tapping on an exposed pulse of purpose that seemed so insignificant now compared to where I had been. The question arose, what does female power look like? I think of the portrait of the sunflower I took the other day. How each folded back petal is anchored so beautifully in that which it can no longer see or know, but trust will continue to provide nourishment. Maybe that’s the point. Like Nora at her post at the edge of the meadow facing the woods, as if sitting on a throne, unafraid, facing into the unknown woods beyond with calm and anticipation at the same time. And then in the next moment she shares her ferocity with Yogi, energetic playing with delighted growls and spirited energy that is met fully by her little brother. It does my heart good to see such abandon and trust. Maybe the balanced female side is this feeling of simply not knowing, but actually knowing at the same time. Why in the world should we trust like this? Maybe it is only something we can experience when we stop being afraid of what we think we are supposed to look like or be. Magically, my fear of taking on the edge pattern of the next part of the knitting was gone. I just started doing it. I’ve had to set the knitting aside this morning. I’m clearly lost again in the backtracking. This infection isn’t old enough to warrant antibiotics yet and so I guess I need to pay attention. Not be afraid of feeling so crappy. Knowing that I have some time yet to let this infection resolve naturally. P.S. Beautiful shawl, a treasure.